Psoriasis,is a Greek word meaning "itching condition" or "being itchy",from psora, "itch" and -sis, "action, condition"; also termed psoriasis vulgaris. It is a common, chronic, relapsing/remitting, immune-mediated systemic disease characterized by skin lesions including red, scaly patches, papules, and plaques, which usually itch. The skin lesions seen in psoriasis may vary in severity from minor localized patches to complete body coverage.The disease affects 2–4% of the general population. Indian herbs introduce Soricure which is specifically developed for Psoriasis. 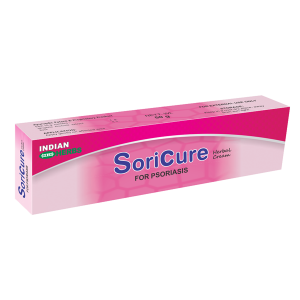 SoriCure is a cream based herbal product containing standardized Wrightia tinctoria extract.